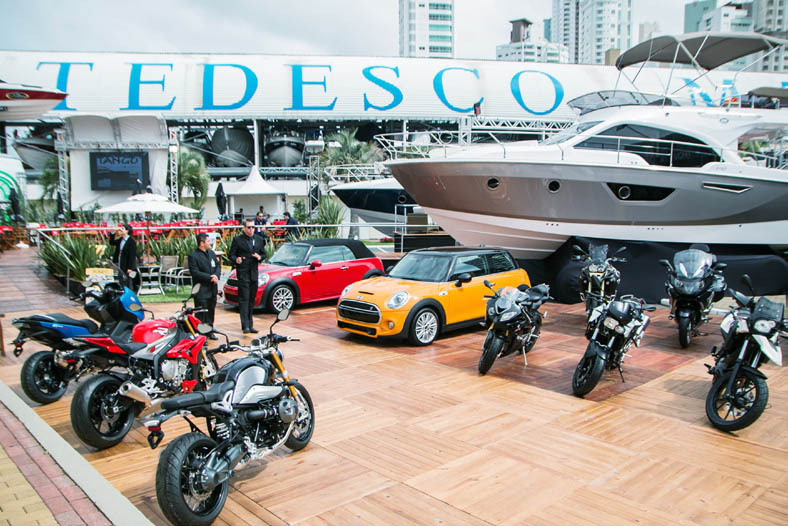 Acting in the dynamic nautical market and maintaining standards of excellence in its services, Tedesco Marina Garden Plaza is inserted in the fascinating scenery of Balneário Camboriú, State of Santa Catarina, strategic point of national tourism. 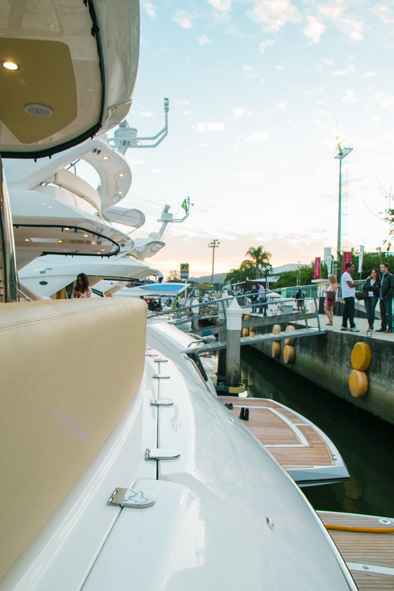 With capacity for 500 vessels of up to 120 feet in dry and wet waves, it is the first international marina in Santa Catarina, positioning the State of Santa Catarina in the national nautical scene. 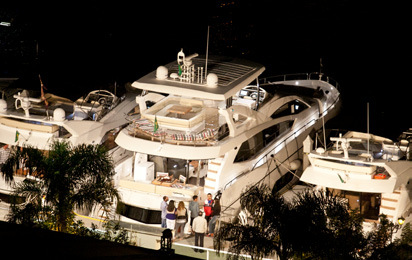 Inaugurated in September of 2006, Tedesco Marina was a landmark in the nautical of the South of Brazil. 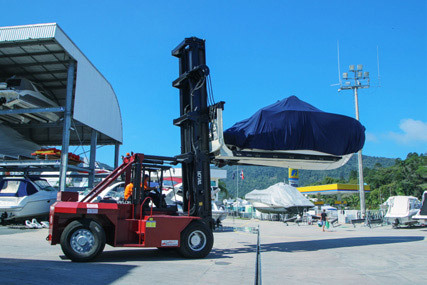 Tedesco Marina brought the international standard of marines, infrastructure and technology in equipment and environmental preservation, being the first marina in Brazil to have the pump out system, aspiration of the black waters of vessels that do not have biodegraders. 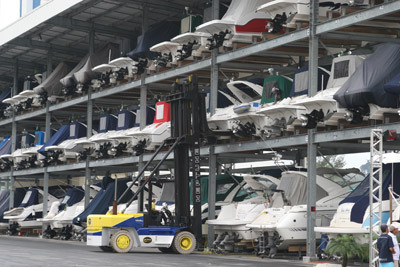 Tedesco Marina has dry runs in three hangars of up to four floors and 100 wet waves. 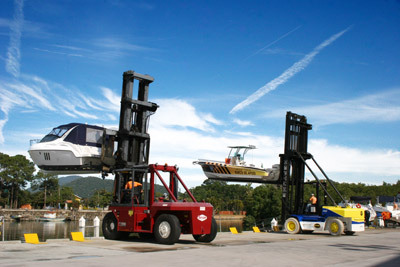 The equipments for lifting are three forklifts for boats of up to 12 tons and travel lift for up to 50 tons. All purchased from North American companies with more than 60 years of experience. Wet waves with electricity, water and wi-fi internet. Meeting point for lovers of the sea, Tedesco Marina has a leisure structure with comfort for its clients, counting on Gourmet Space, Deck Place and AM / PM Convenience Store. 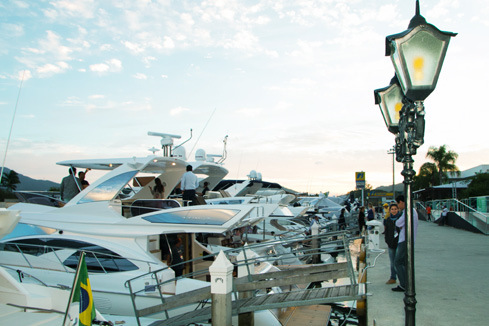 The Deck Place is the ideal ambiance to pack late afternoon in the summer, happy sunsets, special events – such as product launches and services for the select Tedesco Marina customers – and a delicious gourmet feijoada (dish of beans, meat and yummy spices) for Saturday lunches. Top Tourism Award ADVB 2008. Case: A Marina dos Olhos dos Catarinenses. Award from the Brazilian Hotel Industry Association - ABIH-SC. Featured Equipment 2008. Company Citizen ADVB 2009. Case: Tedesco Marina Green. Tedesco Marina Garden Plaza is an example of ecological preservation and maintenance, constituting a showcase for customers and visitors and proving that simple actions achieve great results. Since its inauguration, it has developed affirmative actions of responsible environmental sustainability. 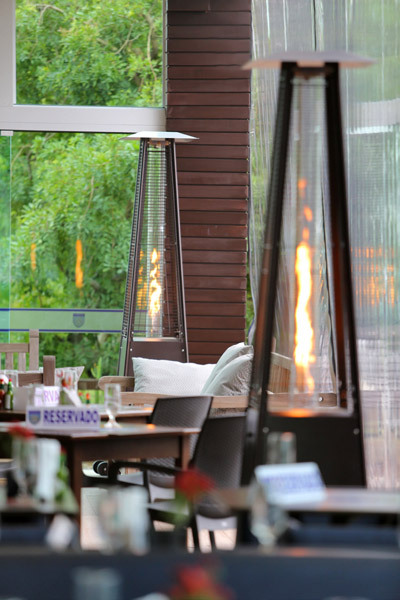 Its constant objective is to preserve and maintain the environment in which it is installed. The set of actions of preservation, recycling and alternative processes that preserve the environment receives the name of Tedesco Marina Green. 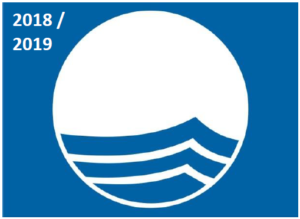 The Blue Flag is an international environmental certification program for beaches, marinas and boats. It is an initiative of the Foundation for Environmental Education (FEE), with the objective of raising awareness among citizens and decision-makers of the need to protect the marine and coastal environment and to encourage the realization of actions that lead to the resolution of existing conflicts. The program has a socio-environmental character widely recognized throughout the world. 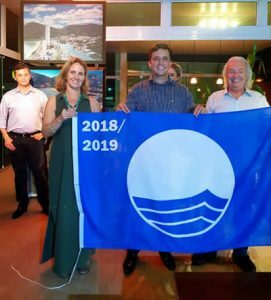 Demonstrating its concern and understanding the importance of socio-environmental issues, in 2018, Tedesco Marina obtained Blue Flag certification, through compliance by the marina with the criteria established by the Program. In view of this achievement, Tedesco Marina joins a select group of companies certified by this Program. 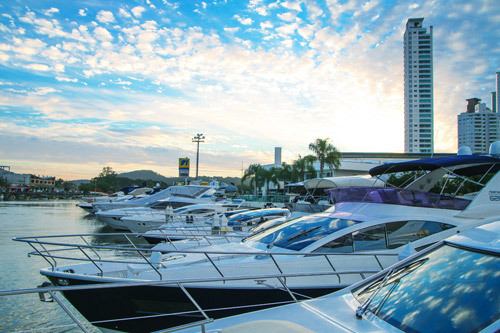 In Brazil there are only 5 marinas with this certification, which proves Tedesco Marina’s degree of excellence regarding socio-environmental issues. 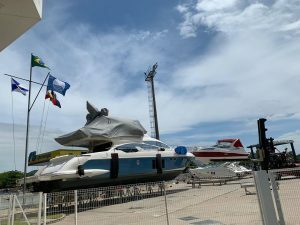 Every year in September, Balneário Camboriú is the stage for one of the main and most charming nautical events in Brazil: the Nautical Festival Tedesco Marina. 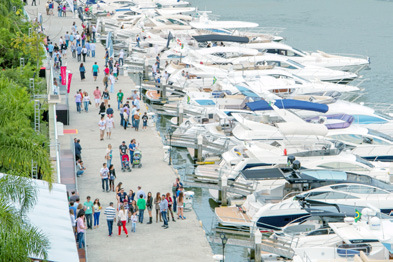 For five days, the marina opens its doors to the public and presents the innovations of the sector, exposing and commercializing boats, nautical equipment, as well as real estate, vehicles, products and services of the luxury market. 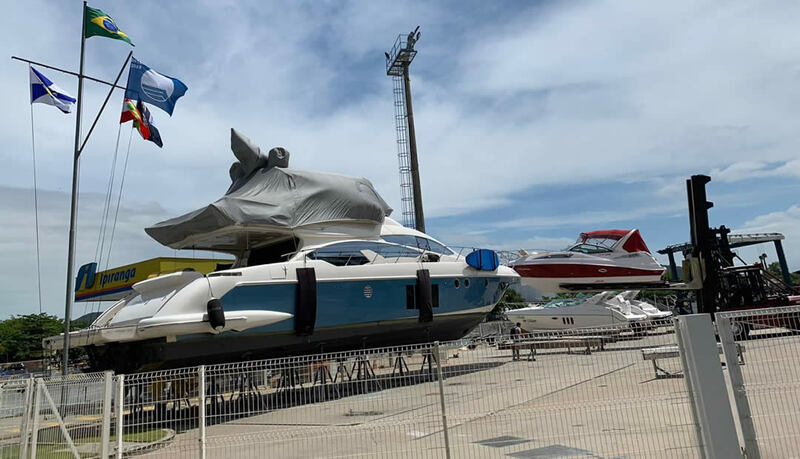 In about 4 thousand square meters, the event counts on the main shipyards worldwide exposing dozens of boats, with values ranging from R $ 250 thousand to R $ 21 million. 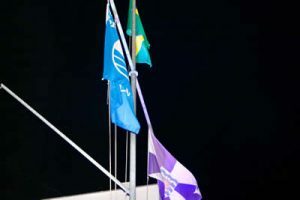 The event also offers with course and proof of Arrais and Mestre Amador, being the only event in Brazil in which the participant is certified. 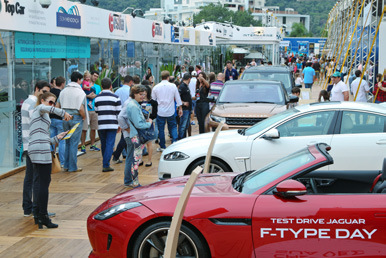 A reality in the receptive of cruise ships in Balneário Camboriú. With adequate infrastructure for safe and comfortable boarding and disembarkation of cruise passengers, Atracadouro Barra Sul made it possible for cruise ships to arrive in Balneário Camboriú. The transatlantics, moored in the natural port of Praia Central, about a kilometer from the dock of Barra Sul, have become the city’s new postcard every season of cruises and a new tourist attraction for Brazil and abroad. 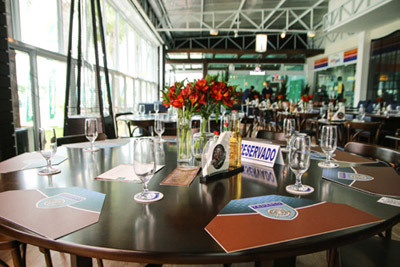 Atracadouro Barra Sul has a covered area, energy substation, lighting, bathrooms, scanners and, for tour boats, all the services provided by Tedesco Marina Garden Plaza.